I LOVE being my little man's mom. I am grateful daily to be able stay home with him. Today we got all bundled up and played outside in the snow. We went to the library and checked out the movies Superman & Jungle Book. We snuggled up in a chair at the library and read a book about monsters. When we got home we played animal charades. On his turn, he rolled around on the ground making strange sounds. He said he was an alien. I pretended to be a chicken. He guessed I was a dog. He did a strange dance around the room. Turns out he was a dancing T-rex. We acted out the story Hansel & Gretel. I put him in a cage made from two laundry baskets and fed him crackers to fatten him up. Once he was fat I made him into stew. As I stirred him in the stew he suddenly turned into He-Man, jumped out, and pushed me in. 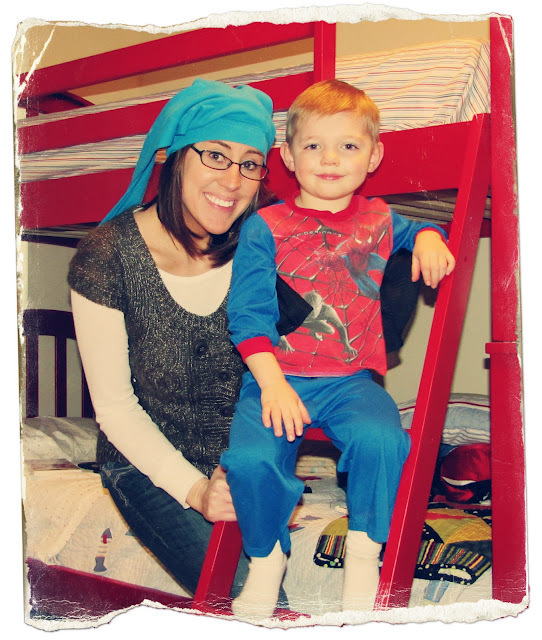 He changed into his Spiderman jammies (to look the part) and made me put his Spiderman pants on my head (see picture above). I get holes in my jeans more quickly now than I did as a kid. I spend my days sword fighting, wrestling, and playing Legos. I rarely have time to read, work on hobbies or do anything that "I" want to do. My little man is so worth it!